Get Off My Tennis Lawn! Serena Williams serves to Alize Cornet during their women’s singles third-round match of the 2014 Wimbledon Championships on June 28, 2014. 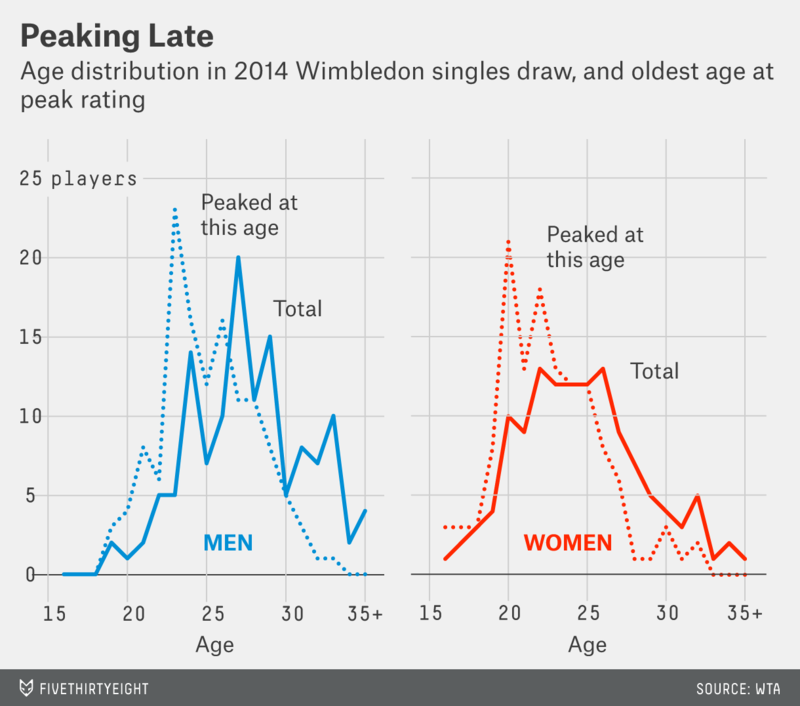 Don’t let the Wimbledon headlines touting rising young stars fool you: More than ever, tennis is a sport for the old. Old is relative in tennis, which has a long history of teenage champions. 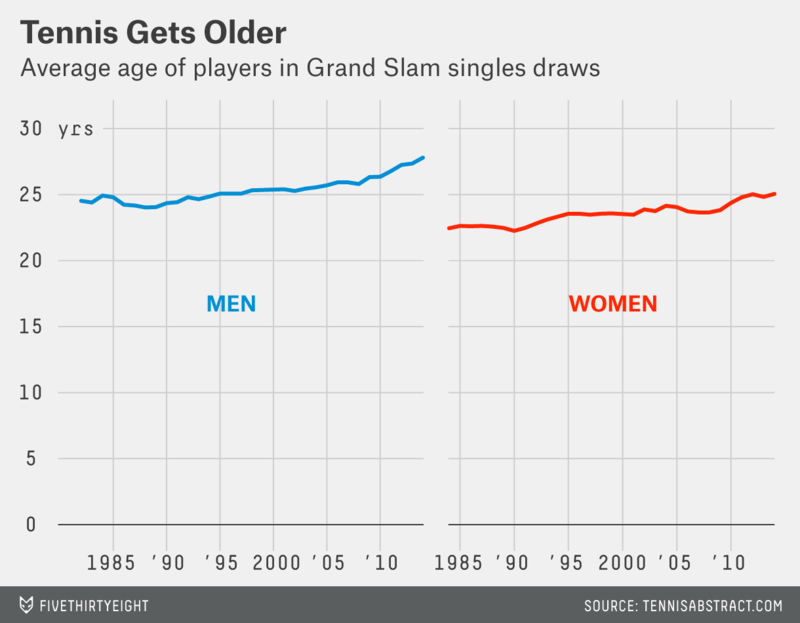 But in the past five years, the average age of players in both the men’s and women’s Grand Slam singles tournaments has risen by about a year and a half, to over 28 for men at this year’s Wimbledon and over 25 for women — the oldest in at least 30 years for both. Tennis oldsters are sticking around longer, and succeeding, because they’re enjoying the longstanding benefits of age, such as experience and increased strength, while mitigating the potential negative effects thanks to improved training and a relatively weak younger generation. A shift of tactics from the net to the baseline also has prioritized the wisdom of age in point construction and shot selection over innate talent and touch. A few young stars-in-the-making have obscured the broader aging trend this past fortnight. Two 23-year-olds, Milos Raonic and Grigor Dimitrov, have reached the semis. Raonic got there by ousting 19-year-old Nick Kyrgios, who stunned Rafael Nadal, 28, on his way to the quarterfinals. The second women’s semifinal Thursday featured 20-year-old Eugenie Bouchard defeating 22-year-old Simona Halep. These breakout performances, and the early exits of Serena Williams and Nadal have felt like a changing of the guard. But the young Wimbledon set isn’t leading a generation on the rise; they are the generation on the rise. They’re the outliers, by far the best of a group of mostly disappointing players in their late teens and early 20s. And not all of them have shown whether they can consistently succeed against older rivals. Jerzy Janowicz and Tamira Paszek are among many who have looked like future stars at recent Wimbledons, then failed to carry that success into other tournaments. They both will be ranked outside the top 30 when this tournament ends. Oh, and the two favorites for the men’s title, Novak Djokovic and Roger Federer, are 27 and 32, respectively. That was true in the past, but not now. The successful old-timers have left little room for the tour’s youngest players to break through. After Kyrgios, the next highest ranked player under 20 is No. 243 Borna Ciric, according to Tennis Abstract. A decade ago, 13 teenage men were ranked higher than that. No man under 23 ranks in the top 50, down from 14 in 2004. Among these late bloomers is Stan Wawrinka, who is playing at a career-high ranking of third in the world after winning his first Grand Slam and first Masters title — a tier below the Slams — this year. He reached the quarterfinals here and lost to his older fellow Swiss player, Federer. Journeymen also are enjoying the aging trend. Victor Estrella, a Dominican who turns 34 next month, is at a career-high ranking of 91. Until this year he’d never played in a Grand Slam; he has played in the last two. Estrella said lighter rackets and improved training techniques have helped him achieve his lifelong dream of playing in a major. The tours and tournaments have also helped by spending more on physical therapists, with greater tennis-specific experience, and on tracking player injuries, according to Todd Ellenbecker, director of ATP Medical Services. While improved equipment and fitness regimens can help older players last on tour, their increased strength helps them withstand the punishing baseline rallies that characterize today’s game. “Maybe tennis is getting tougher and tougher, and you take longer to get where you have to,” 31-year-old Gilles Muller, who qualified for Wimbledon this year, said. “It’s showing that if you can make it at a younger age, you can have a career that lasts 10 or 15 years, which is awesome,” Denis Kudla, the 21-year-old American who qualified for Wimbledon, said in an interview last month. He has also benefited from the longevity of his elders, by befriending tour veterans and tapping into their wisdom. It’s possible the aging trend is a fluke — a reflection of the natural variation in generational talent. Maybe it’s just a coincidence that Nadal, Djokovic and Andy Murray all were born in a 12-month span over 1986 and 1987, and that sisters Venus and Serena Williams, both in their 30s, remain far better than most players who are five or 10 years younger than they are. The WTA, the women’s tour, provided the women’s data, while I calculated the men’s numbers from the ATP World Tour website.